June 2, 1934: "The dirt road wound upward in a great slow spiral, taking what must have been three or four miles to cover the mile of territory which lay between the tiny crossroads settlement of Pelham Center and our goal of Jeremy Hill, 'Jeremiah Hill', the natives told me it used to be called, and as the two of us chugged upward, the reasons for such a doleful moniker became more and more apparent. If no recluse ever toiled to its summit to do his wailing in strictest privacy, the wind would have done it for him. Jeremy Hill, to city eyes, seemed the lonesomest spot on earth. 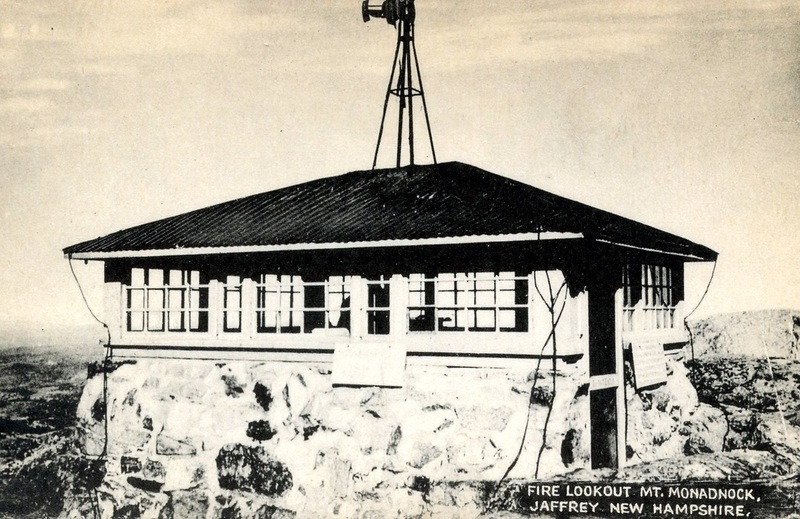 ...The Jeremy Hill station, operated jointly by the U.S. weather bureau and the New Hampshire forest fire service, is one of the four key weather stations in New England. 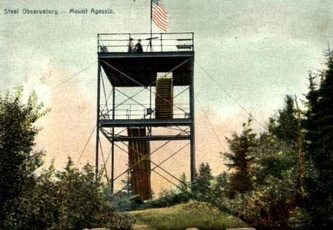 August 4, 2006: A new tower cab was airlifted to the Magalloway Mountain tower. 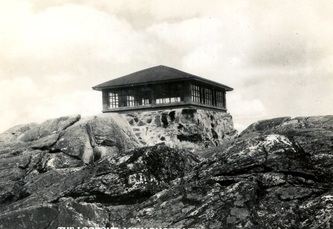 September 18, 1972: "Another era in the history of Grand Monadnock, the majestic sentinel of southwestern New Hampshire, came to a close recently as a 45-year old foundation and a 20-year old building, most recently used as a refreshment stand, were dismantled and removed from the summit of the mountain. Monadnock State Park crews with cooperation from the Society for the Protection of New Hampshire Forests and the support of the Monadnock Region Association took action because the building was being vandalized and used as a giant trash can, thus outliving its original purpose and usefulness. Hammers, wrenches, chisels and crowbars were back-packed up the 3,165-foot peak and the demolition crew pulled, tugged and pried timbers and boards apart and chiseled iron supporting bars out out the cement and granite foundation. Wood was piled in a natural fireplace depression a hundred feet from the building site to be burned under proper weather conditions. All metal including the corrugated roof were laboriously back-packed off the summit to the site of the former Half-Way House, from where it was trucked to the town dump. The foundation is in the process of being pried and hammered apart, with each stone to be removed from the summit. Thus, for the first time since 1914, the summit of Mount Monadnock will reclaim its natural beauty, as the structure built by man was eventually abused and destroyed by man. 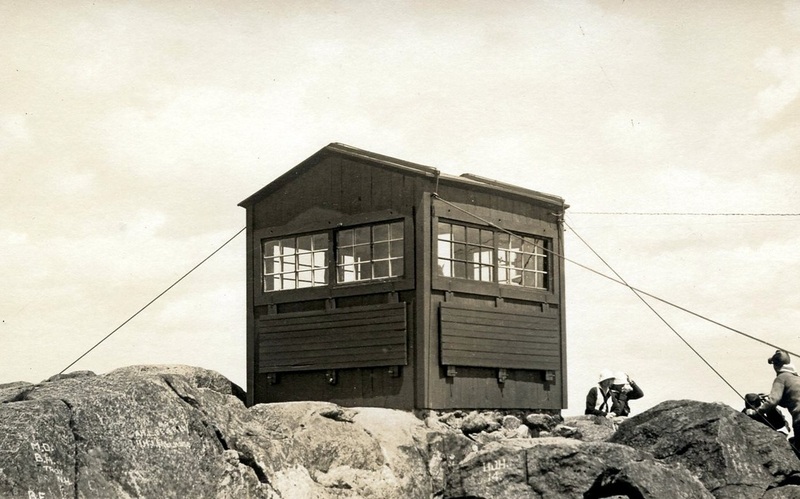 Almost 60 years ago, the first fire lookout tower was erected on the mountain summit and supported by numerous guy wires. 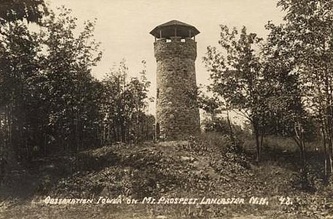 Residents of the area found the site to be ugly, so in 1928 a foundation was constructed in a depression slightly off the summit and the fire tower was rebuilt in a manner to keep it from jutting into the skyline. 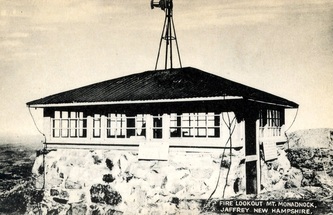 By 1948, the building had weathered badly and was being vandalized by climbers, requiring the N.H. Park Department to remodel the building in 1952 for use as a concession stand, which lasted five years. Once again, in 1957, the building was dismantled and completely rebuilt, with over 3,000 pounds of material which was back-packed up the mountainside. Shortly afterwards, vandals chopped holes through the metal roof and repeatedly broke into the stand. 1942: A 40-foot steel tower was erected east of the original site. 1985: The tower was dismantled and removed from the site. September 18, 2013: The authorization to sign a contract with a stonemason is on the agenda of the Governor and Council meeting in Windham. Work to be done on the stone structure will include removing old weak mortar on the exterior surfaces, restoration of the mortar and missing stones and sealing around the windows. The last work of this nature was done in 1964. August 1, 1947: "A seven-year-old Irish setter trying out for the first time as a search dog, found the missing Mrs. Libby Ferrin today nestled into a bed of grass and pine needles within a half mile of the Pawtuckaway Mountain home she wandered away from six days ago. The 60-year-old woman, wife of James Ferrin, the mountain's forest fire lookout was resting comfortably tonight at an Exeter hospital where she was taken after Boy Scouts slashed a path through dense underbrush to a waiting ambulance. Her face was scratched and bitten by mosquitos, but otherwise she was unharmed.